This page is about the Russian fighter Yak-1B. For the German version, see Yak-1B (Germany). For the earlier version, see Yak-1. The Yak-1B is a rank II Russian fighter with a battle rating of 3.3 (AB/SB) and 3.0 (RB). This aircraft has been in the game since the start of the Open Beta Test before Update 1.27. The standard armament for most Yakovlev aircraft: One machine gun and one ShVak cannon; with 200 and 120 rounds each, nothing out of the ordinary. Good against aircraft, but against anything more significant the burst-mass is lacking for quick take-downs. The improved Yak-1 features, like most mid war water-cooled fighters, a 1140 hp engine. It remains sub par to the German equivalent. However, at the time this plane was fielded most enemy vehicles were of heavier weight, further increasing the Yak series excellent maneuverability. 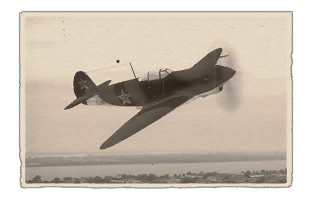 Unfortunately, in-game the aircraft is tiered with earlier vehicles, this shifts the performance spectrum of the Yak-1B towards engine power. 64 Bulletproof glass in cockpit front and rear. Their biggest problem is engine overheating, but this is easily fixed by simply flying between 80%-90% throttle. The Yak's performance is not hindered in the slightest by flying at this engine power. Due to the above two facts, in AB: fly at 90% power. The Yaks can dogfight just fine at 90%, and will rarely overheat. Even though in Arcade battles all planes get WEP, the WEP on this plane adds almost nothing to its performance while rapidly overheating the engine, thus using WEP is practically unnecessary. If you find yourself in a situation where your aircraft needs more power, throttle up from 90% to 100% power, however, remember to throttle back down to 90% once you can. Wait for the dogfight to start, then fly in behind a distracted enemy. Shoot in bursts unless tailing a bomber, in which case you will not last very long against their rear gunners unless you are incredibly accurate with the cannon. If your engine begins to overheat, start flying back to your airfield. Otherwise, your engine will give out after the temperature gauge turns red. To sum up, this is merely a better version of the Yak-1, with similar tactics and strategy. Just remember that Soviet fighter aircraft in general count heavily on it's pilot's accuracy having, in this case, only one good gun! You will have run your engine out trying to climb, so your engine has less time before it overheats than usual. (You also don't climb as fast as most other planes, in fact, there are better Soviet aircraft for climbing, such as the MiG-3 and the La-5). You will be highly visible. You will have reduced manoeuvrability. You will easily rip your wings upon trying to dive (The Yak's wings, is made of wood, disappear at about 600 kph). Better camouflage... harder to spot. There is almost no chance of ripping wings. You are already at optimal altitude and speed for manoeuvring. Enemies easily overshoot you or rip wings attempting to dive on you. You can trick enemies into flying into the ground (make sure you don't do so yourself!). Right before entering a dogfight, bring your throttle to 90%. Flying at this reduced throttle setting in Realistic Battles is enough to fight at below 1,000 m (some experienced Yak pilots will even dogfight at 80% throttle!). Immediately after battling it out, bring the throttle back down to 80% (if you don't already have it there). Only in extreme cases use 100% power; however, maintaining that speed tends to overheat the engine quickly. It is recommended to avoid firing at ground targets due to the limited ammunition available for use against other planes. Remember that you do not reload in mid-air in Realistic Battle, so ammunition conservation is critical while closing the distance with the enemy before firing. Remember, fire only in short bursts to conserve ammunition and avoid jamming the guns. The great thing about the Yak's guns is that they are centre-line mounted. Guns mounted in the propeller shaft mean that you do not have to worry about convergence points, instead lead the target and snipe. The drawback is that you cannot spray the mark with a hail of bullets like most players tend to do. This plane and all the Yaks afterwards are about accuracy and skill necessary to handle this agile plane, and it's hard-hitting cannon (that all non-Soviet pilots complain about) to compensate for the lack of ammo. The machine gun is lacklustre and is only useful once your cannon ammunition has run out (you use the machine gun as protection on the way back to the airfield). When landing, slow the aircraft to BELOW 300 km/h before lowering the landing gear! Many Yak pilots have ripped their fragile landing gear when descending too fast with them extended. The last thing all Yak pilots should know in Realistic Battles is never to climb higher than 3,000 m (at or below 1,000 m is preferred). The Yak line of fighters was not built to fight at the higher altitudes, and the game is filled with much more capable aircraft in this respect. If you like B&Z or you prefer to climb high, but don't want to use the US or German planes, then use the MiG line or the LaGG/La line of fighters, as they have much better engines. The Yak is a dog-fighter. A Yak pilot can nullify all but the last "Cons" below by staying below 2000 m, and keeping the throttle at 90% for AB, and 85% for RB/SB. If the situation allows, using in-cockpit view can often help with accuracy due to no parallax effect... meaning (hopefully) less of your precious shots wasted. Flaps help with hard turns, but against most opponents, flaps will not be utilized much. Use flaps wisely, since flying at ~90% means a tiny bit less engine power to get back to speed after slowing down due to using flaps. However, don't hesitate to use flaps if the fight depends on it, it is easier to regain speed than to pay for a new plane! 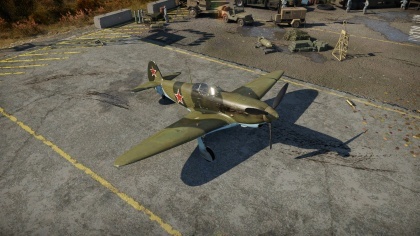 Everything learned from the Yak-1B applies to all of the later Yaks mastering this plane will repay itself in gold later. A6M2 Zeroes: They will out turn you, so try to attack in a shallow dive rather than a turn fight. Energy fighting is also okay because Zero has poor energy retention and terrible high-speed control and handling. P-47Ds: They are much faster than you and are excellent at boom and zoom, so avoid them if possible. If you are caught in a fight, try to energy fight them or turn to fight them. Other Yakovlevs: They are slightly slower, so either keep them occupied with manoeuvres such as the scissors and barrel rolls or energy fight them. Spitfires: They are significantly slower but has a turn radius that could embarrass a Zero, and their Hispano cannons are significantly more deadly than you ShVAK cannon. Try to energy fight them as that can overcome your worse manoeuvrability. Boom & Zoom is also an option in arcade battles, but never try to turn-fight a Spitfire. With the Yak line of fighters, Always research the engine and performance modules first! Adding power upgrades will help to lower the overheating of the engine. Afterwards, the aircraft modules can be unlocked in any order according to pilot preference. The Survivability modules are recommended next, as they improve the Yak-1b's manoeuvrability and survivability even more. The Armament modules improve only by adding ammo belt types available but also allows the usage of 100 kg of bombs. This page was last edited on 7 April 2019, at 13:47.